Here are the first few entries - you'll notice that, in the traditions of pretty much any language, I freely borrow words and phrases as I come across them and adopt them into my lexicon! I'll be adding all these and more as I think of them into a Melsh dictionary page here on my blog - check the tabs at the top to see it appear soon! Christmas is ruined! It doesn't actually have to be Christmas, it could be a holiday, a meal, anything that should be special. This phrase is only to be used when something tiny and unimportant has gone wrong, and suggesting that the event is ruined is a massive overreaction. Determinded (pronounced detter-mine-ded): Meaning determined, this came about when The Brother declared how 'detter-mine-ded' he was to do something. We all adopted this new word immediately. Eyebrax: A word of Australian origin. Many thanks to Amy's The Four Year Old who coined this delightful and useful contraction of 'eyebrow wax'. Gazinta: The mathematical notation for division. It helps you work out, for example, how many times 5 'gazinta' 40. Right, I think that's enough to be going on with! But look out for these and other Melsh words and phrases in my all-new dictionary blog page - and don't forget that you can request new additions and definitions as required! I Speak Melsh <-- You are here! Note: If any of the posts aren't up yet, please bear with us - the different time zones and the peculiarity of blogging platforms when it comes to autoposts may mean that one or two posts don't appear on time! If that's the case, come back to this list to pick up from the next blog, but do please pop back and try the other link later, when the post should be there for your enjoyment. Once you've visited all the blogs, you should be able to answer these few simple questions, and enter my giveaway! On which blog will you find a post on the letter 'W'? 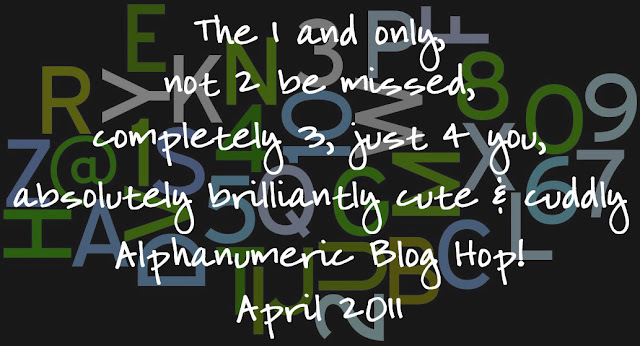 On which blog will you find a post on the number '1'? On which blog will you find a post on the letter 'J'? On which blog will you find a post on the number '5'? And finally, on which blog will you find a post on the letter 'H'? Thank you for doing such a MARVELOUS job of coordinating the hop! I'm sure we are all going to enjoy it. Those are great def's Mel! Thanks for organizing the Hop!! Oh super duper love the definitions especially losables that one has to be added to mine too though I think most of my losables are probably much bigger things. I am so excited that you've started a dictionary Mel - this will be very helpful! :>) I really like deter-mine-ded and losables - will be looking for ways to add those in my conversations today. Thanks for all your work organizing this fun hop - off now to check out all the numbers & letters and maybe even invent a word of my own. Thanks for organising the blog hop Mel! I'm looking forward to spending a happy hour or so browsing through the entries! Great start Mel & I love and will adopt Losables! I'm kinda the opposite to you as in I live in the west midlands so as A dear friend (widely known as choccy orange) put it I speak posh Brum, but I also come out in a welsh accent - No of my family (that I know of) are welsh & yet, especially when excited or aggitated I come out in a welsh lilt (think Gwen from Torchwood). This hop looks like it will be great fun. BTW, I like "doofer" but I don't quite get "Dalek go-balls". Thanks for organising this hop. I love the idea of a dictionary, made me think of all the words we use that arent normal, lol. We used to call the remote a NoNo, we always said No No, when DD touched it and in the end she called it nono! Love your Melsh dictionary - think losables will be definitely added to our "orphan" words (as my DH calls them. Looking forward to more entries. What a fun post Mel! Thanks for hosting. what a great idea for a blog hop. love dictionaries and your definitions are very funny. Mel this has been a truly fun experience for me - and I have so enjoyed not only your post - but all the others too. Those definitions are fabulous - we also use doofers -LOL and am definitely going to steal "losables". I love that we are not theonly family to have our own made up words. Love your Melsh dictionary, but is "sod" really a curse word? Here in the U.S. it just means rolled up blankets of grass grown at a nursery that you use to create an instant yard. This hop is compelling - I keep saying I'll look at one more and then I'll rest my eyes for a bit!! But I've managed to reach here and it's good to be able to thank you for doing such a fine job of pulling us all together. The entertainment, as we say round here, has been mighty!! I LOVE your Melsh dictionary! What a great idea! I think I might need a definition of my own for "Carrie-isms." Thanks again for coordinating this fun blog hop - and I love your giveaway rules, too! :) You rock!! Love your definitions. I am an English person, married to a Welshman and living in Scotland - and thanks to my DH serving his country for 23 years we have moved around a fair bit meaning that I have lost any accent so I no longer sound like a Brummy which is where I am originally from. My son is now a teenager - and I am sure he speaks another language entirely from us!! I've made my way around the world, and had just the nicest time! Thanks for all your hard work, Mel. It's so much fun to visit "old friends" and find some new bloggers along the way. Your wonderful Melshisms have brought a big smile to my face. I love Gazinta and Eyebrax, and the Dalek-Go-Balls will remain with me forever! Brilliant BlogHop! Thanks for a great hop, I have really enjoyed it. I know I commented twice, just wanted to add this. Great post Mel! We have our own words here to and could do with a dictionary - one of our favourites which Penny came up with on holiday is to 'photogrificate' things, so we always call it this now! Have really enjoyed the hop - thanks for all the work you have put into it. Love that you are creating a Melsh dictionary that will stay on ther blog! Thanks for conceiving of and implementing a great hop. You rock! Mel your bloghop was a triumph! The blogs were so varied & Im sure I speak for all that we really enjoyed taking part (even me after I got over my nerves!). Thankyou so much Mel. PS we have Dalek bread in this house so we might have to look up some dalek go-balls! Yes, 'eyebrax' has entered folk lore here too! We can up you on the 50 million though - TSYO opts for 150 million when entering a state of over exaggeration! Phew - I'm exhausted with all that hopping - 2 hours plus - but it has been SO much fun to see 50 million fabulous blogs and such creative blogging. BRILLIANT!!! Oh it is a blur it is a blur ... I have hit the hop all in one go and now I think I need to take a long walk to recover! Thanks for all the work Mel - well done, a resounding success! So excited to get started! I've been busy all day but just poured myself a nice glass of wine and am looking forward to hopping around! Thanks for getting us all organize and for telling us a bit more about your own special language. Looks like a great blog-hop. I'll have to do it a little at a time, as "Time" is a challenge for me just now! Thanks for organising this. I will be back (To quote someone other than Kate!). Loved the blog hop Mel, thanks for organising it. Your Melsh dictionary is fabulous too! :o) Fun post, my friend! Just now making the rounds and I wanted to start with you. Your Doofer is our Dangler !! I didn't realise I speak a little Melsh. Doofer is a common word in our family, although it has rather wider useage than just the remote control, which is generally referred to as the zapper. I also, once upon a time, used to read determined as det-er-minded: until someone laughed at me and pointed out my mistake and then I stopped.